5 5 Change It Up! 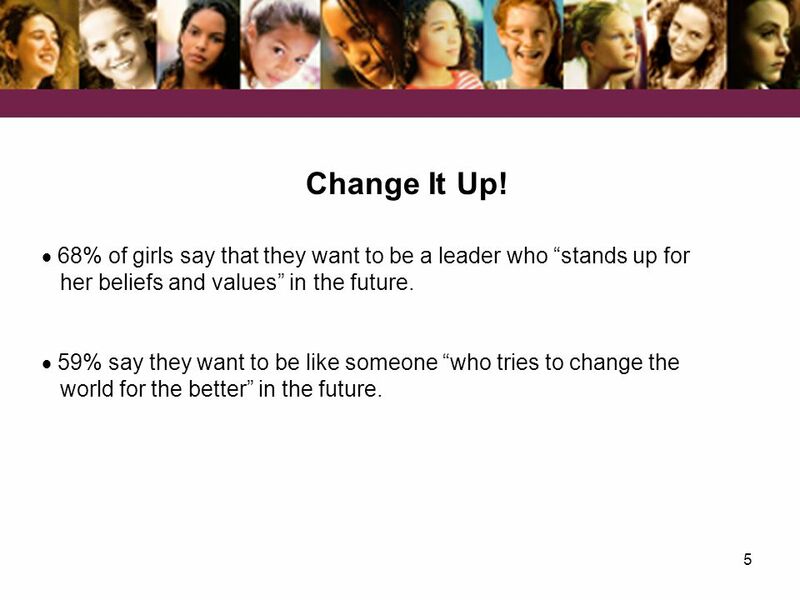  68% of girls say that they want to be a leader who “stands up for her beliefs and values” in the future.  59% say they want to be like someone “who tries to change the world for the better” in the future. 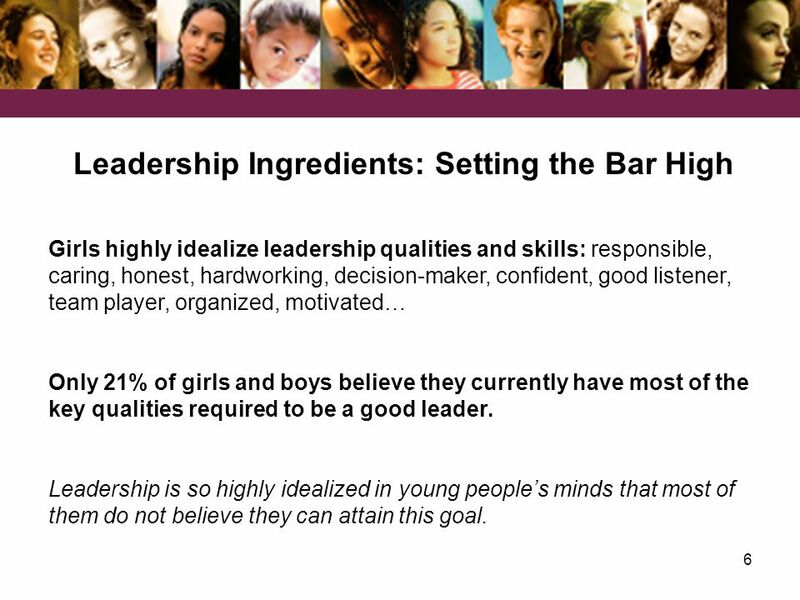 6 6 Leadership Ingredients: Setting the Bar High Girls highly idealize leadership qualities and skills: responsible, caring, honest, hardworking, decision-maker, confident, good listener, team player, organized, motivated… Only 21% of girls and boys believe they currently have most of the key qualities required to be a good leader. Leadership is so highly idealized in young people’s minds that most of them do not believe they can attain this goal. 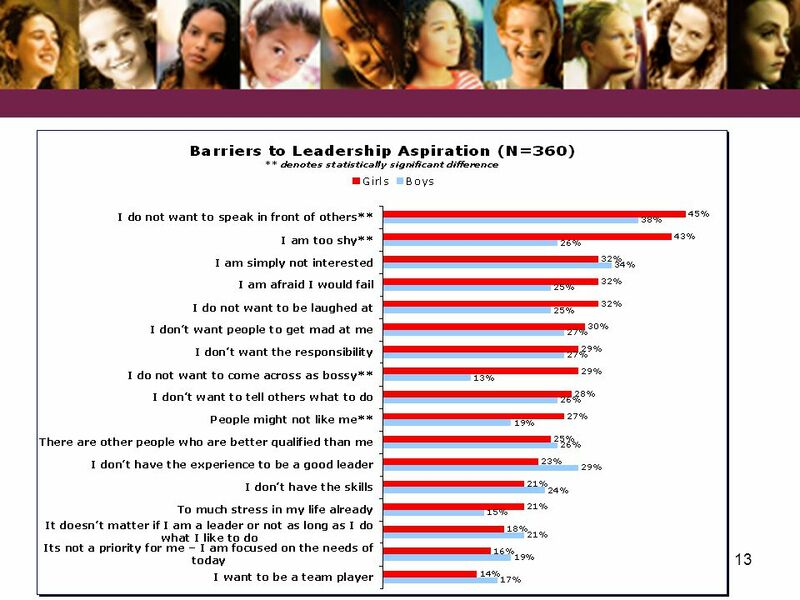 7 7 Leadership Aspirations TODAY: 61% of girls currently think of themselves as leaders. 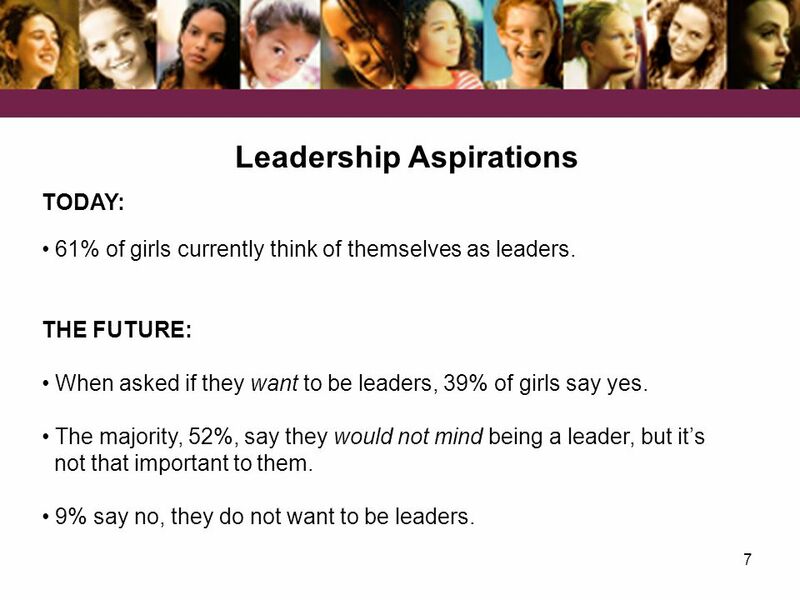 THE FUTURE: When asked if they want to be leaders, 39% of girls say yes. The majority, 52%, say they would not mind being a leader, but it’s not that important to them. 9% say no, they do not want to be leaders. 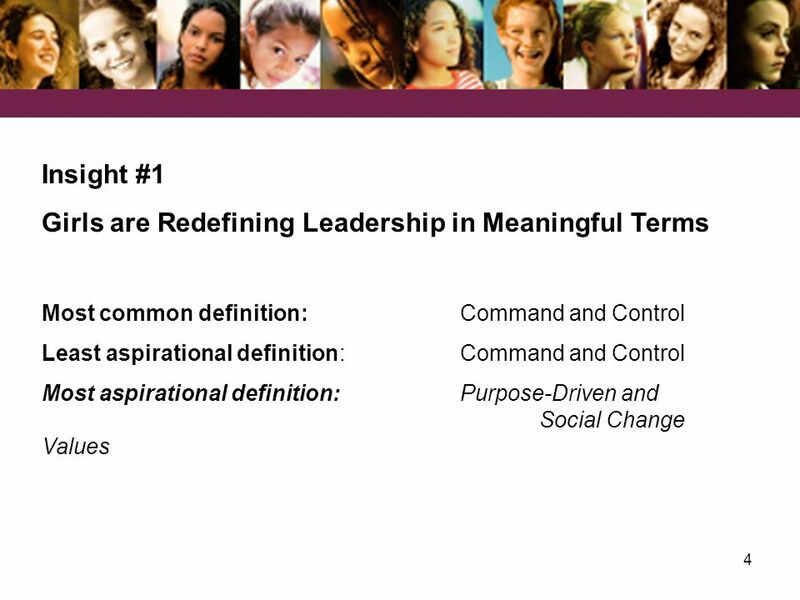 8 8 Insight #1: Girls are Redefining Leadership in Meaningful Terms Insight #1 Implications (1) Make clear which aspects of leadership are at the core of program activities. 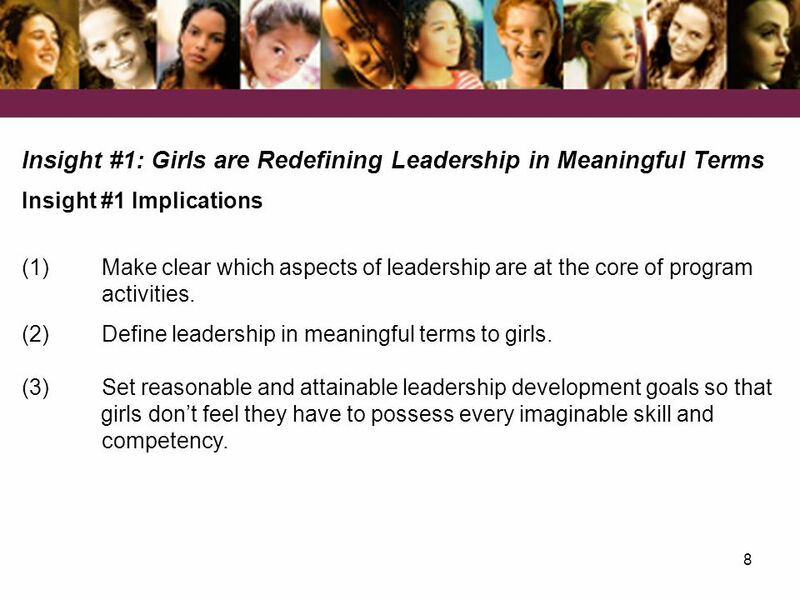 (2) Define leadership in meaningful terms to girls. (3) Set reasonable and attainable leadership development goals so that girls don’t feel they have to possess every imaginable skill and competency. 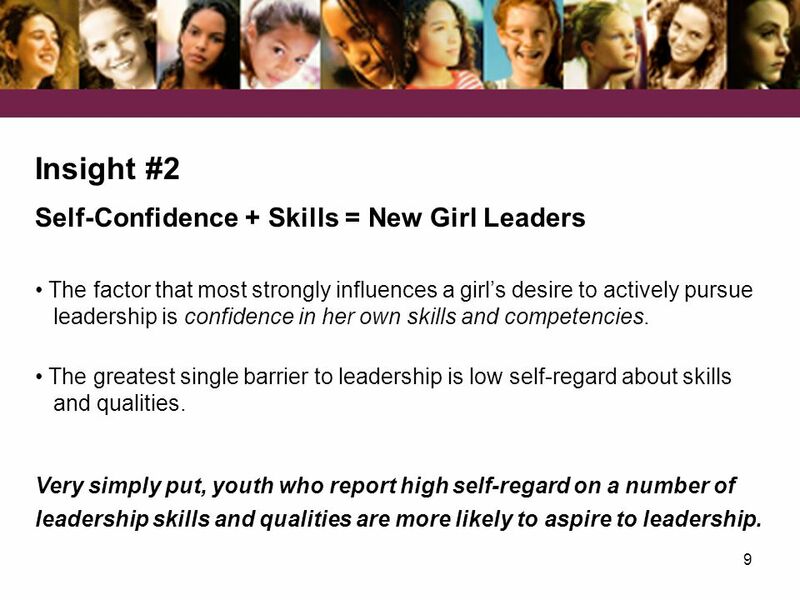 9 9 Insight #2 Self-Confidence + Skills = New Girl Leaders The factor that most strongly influences a girl’s desire to actively pursue leadership is confidence in her own skills and competencies. The greatest single barrier to leadership is low self-regard about skills and qualities. Very simply put, youth who report high self-regard on a number of leadership skills and qualities are more likely to aspire to leadership. 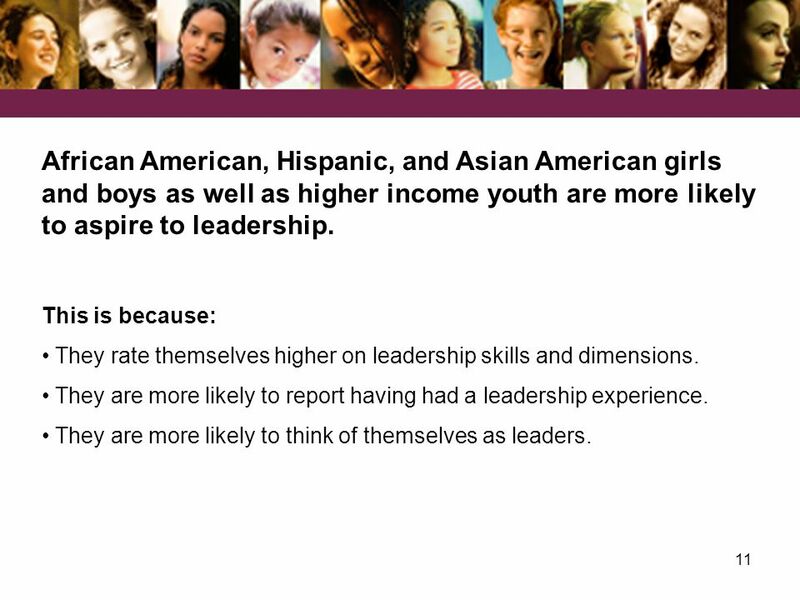 11 11 African American, Hispanic, and Asian American girls and boys as well as higher income youth are more likely to aspire to leadership. This is because: They rate themselves higher on leadership skills and dimensions. They are more likely to report having had a leadership experience. They are more likely to think of themselves as leaders. 12 12 Age and gender have very little effect on a youth’s desire to pursue leadership:  The age effect is significant, but small. 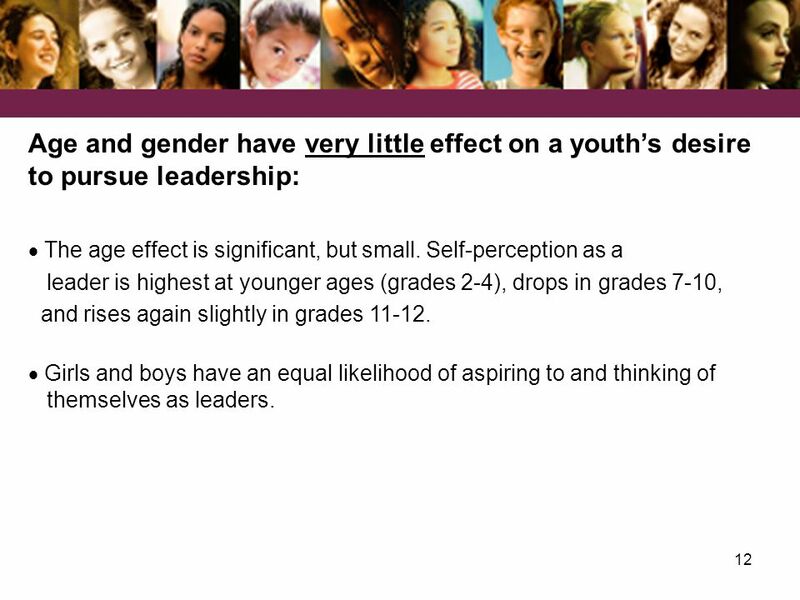 Self-perception as a leader is highest at younger ages (grades 2-4), drops in grades 7-10, and rises again slightly in grades 11-12. 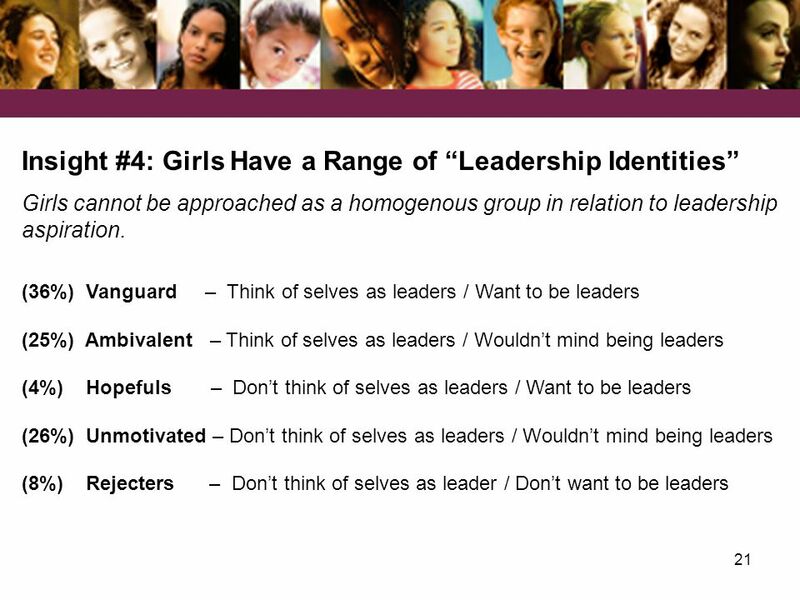  Girls and boys have an equal likelihood of aspiring to and thinking of themselves as leaders. 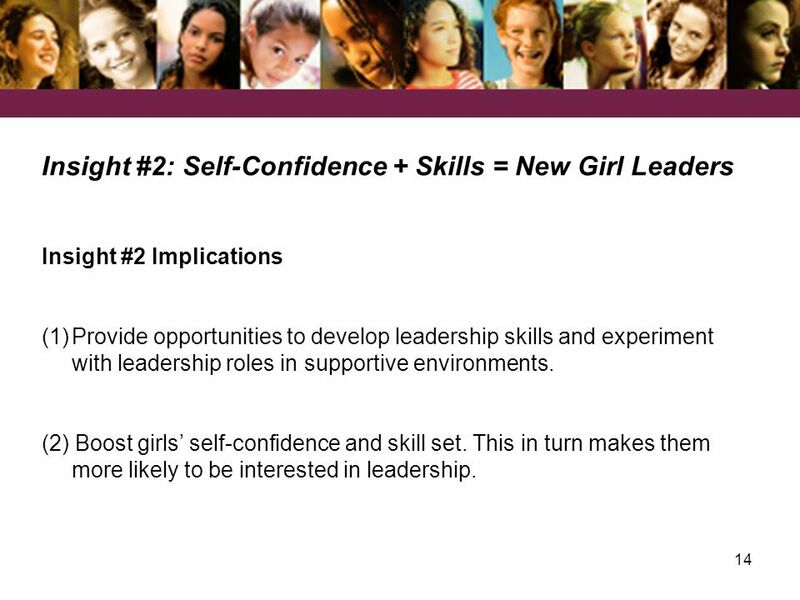 14 14 Insight #2: Self-Confidence + Skills = New Girl Leaders Insight #2 Implications (1)Provide opportunities to develop leadership skills and experiment with leadership roles in supportive environments. (2) Boost girls’ self-confidence and skill set. This in turn makes them more likely to be interested in leadership. 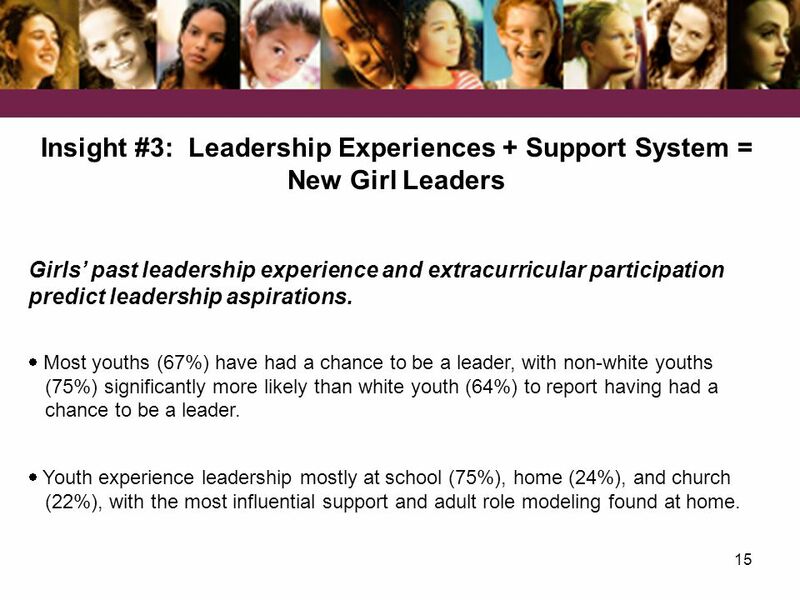 15 15 Insight #3: Leadership Experiences + Support System = New Girl Leaders Girls’ past leadership experience and extracurricular participation predict leadership aspirations.  Most youths (67%) have had a chance to be a leader, with non-white youths (75%) significantly more likely than white youth (64%) to report having had a chance to be a leader.  Youth experience leadership mostly at school (75%), home (24%), and church (22%), with the most influential support and adult role modeling found at home. 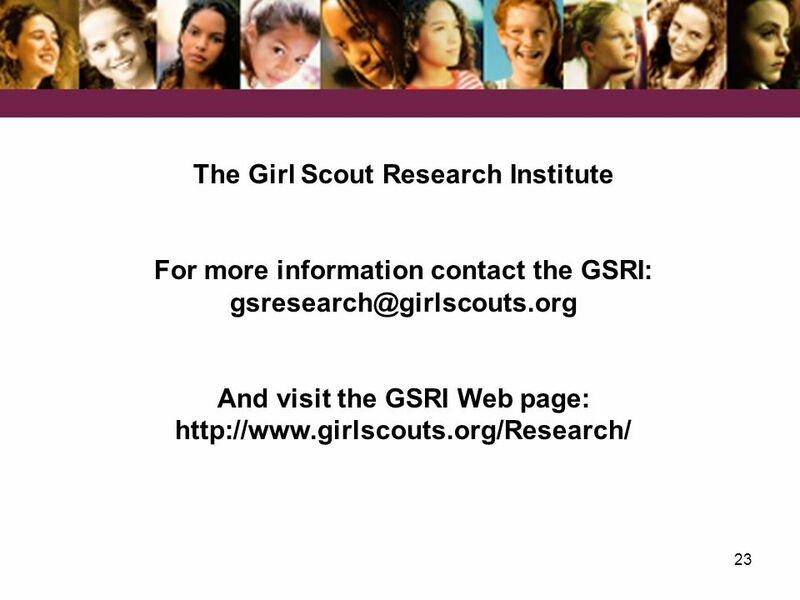 16 16 The Girl Scout Effect  60% of current Girl Scouts report being encouraged to be a leader by Girl Scout adult volunteers. 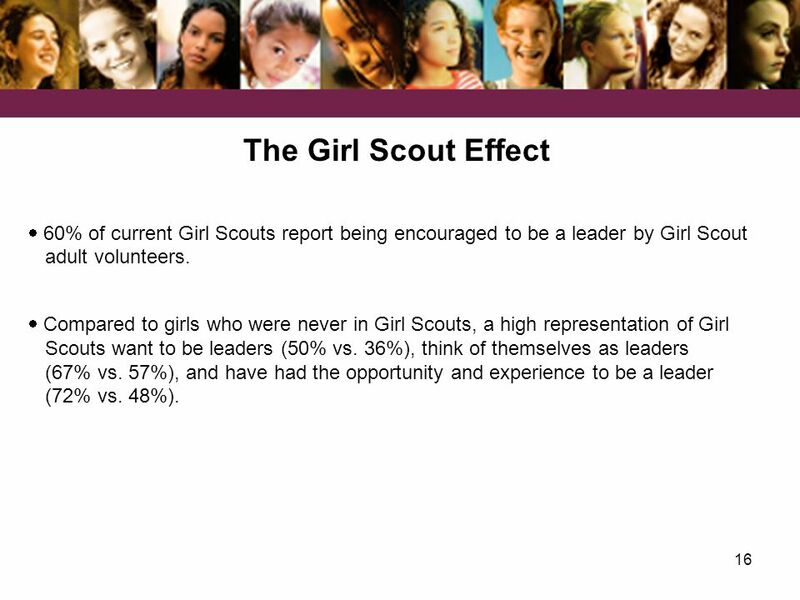  Compared to girls who were never in Girl Scouts, a high representation of Girl Scouts want to be leaders (50% vs. 36%), think of themselves as leaders (67% vs. 57%), and have had the opportunity and experience to be a leader (72% vs. 48%). 17 17 Youths identify family (especially mothers), teachers, and friends as influencers. 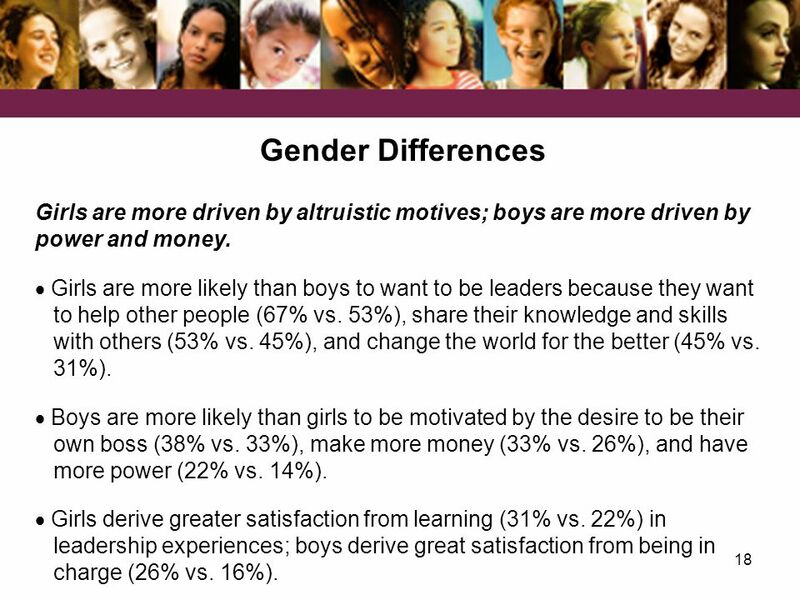 18 18 Gender Differences Girls are more driven by altruistic motives; boys are more driven by power and money. 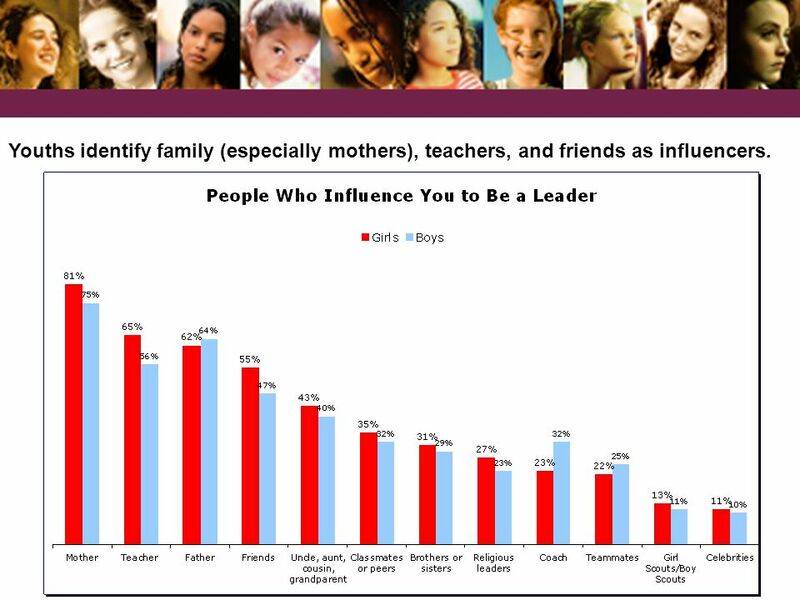  Girls are more likely than boys to want to be leaders because they want to help other people (67% vs. 53%), share their knowledge and skills with others (53% vs. 45%), and change the world for the better (45% vs. 31%).  Boys are more likely than girls to be motivated by the desire to be their own boss (38% vs. 33%), make more money (33% vs. 26%), and have more power (22% vs. 14%). 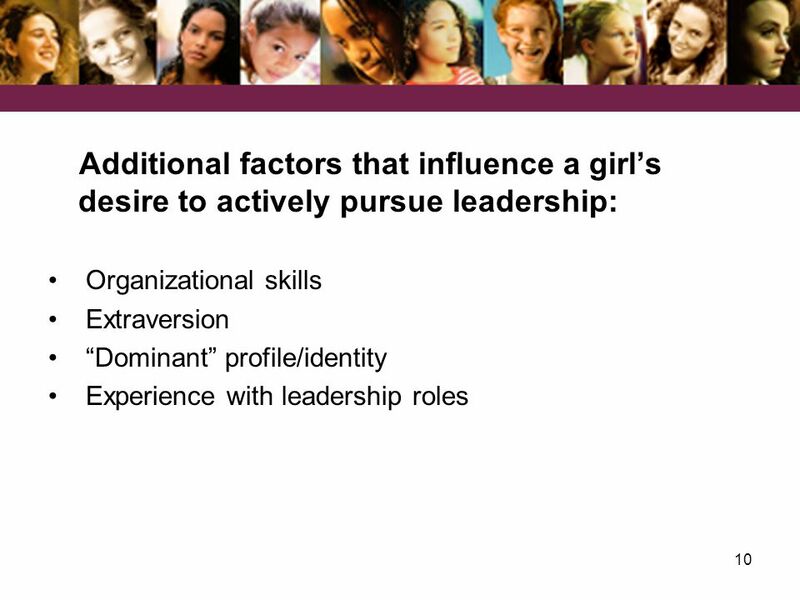  Girls derive greater satisfaction from learning (31% vs. 22%) in leadership experiences; boys derive great satisfaction from being in charge (26% vs. 16%). 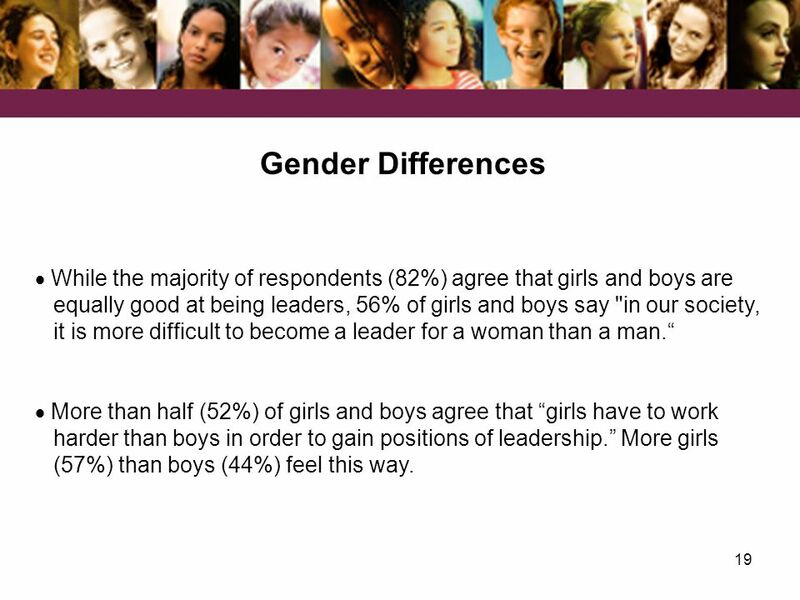 19 19 Gender Differences  While the majority of respondents (82%) agree that girls and boys are equally good at being leaders, 56% of girls and boys say "in our society, it is more difficult to become a leader for a woman than a man.“  More than half (52%) of girls and boys agree that “girls have to work harder than boys in order to gain positions of leadership.” More girls (57%) than boys (44%) feel this way. 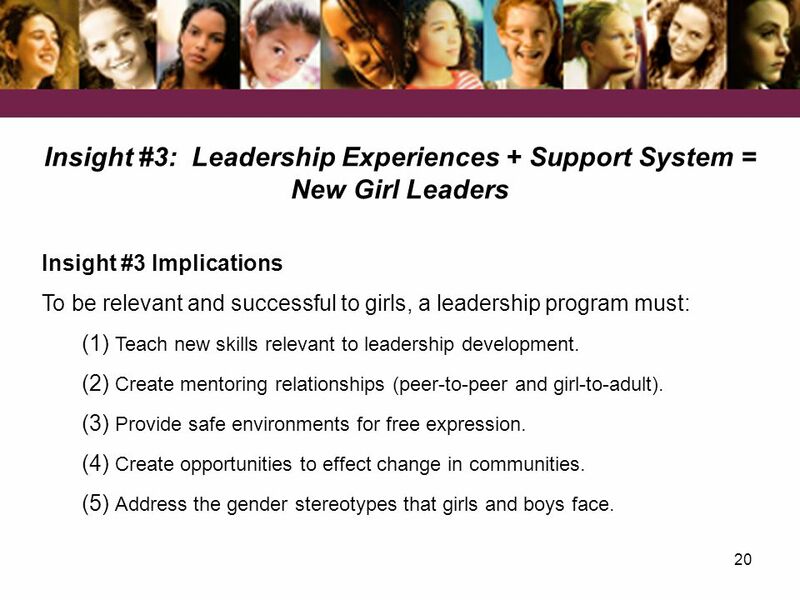 20 20 Insight #3: Leadership Experiences + Support System = New Girl Leaders Insight #3 Implications To be relevant and successful to girls, a leadership program must: (1) Teach new skills relevant to leadership development. 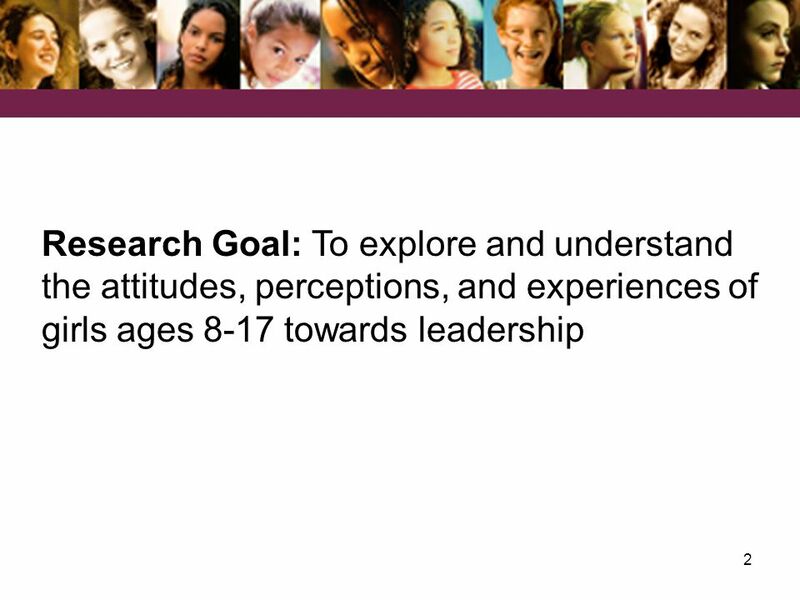 (2) Create mentoring relationships (peer-to-peer and girl-to-adult). (3) Provide safe environments for free expression. (4) Create opportunities to effect change in communities. (5) Address the gender stereotypes that girls and boys face. 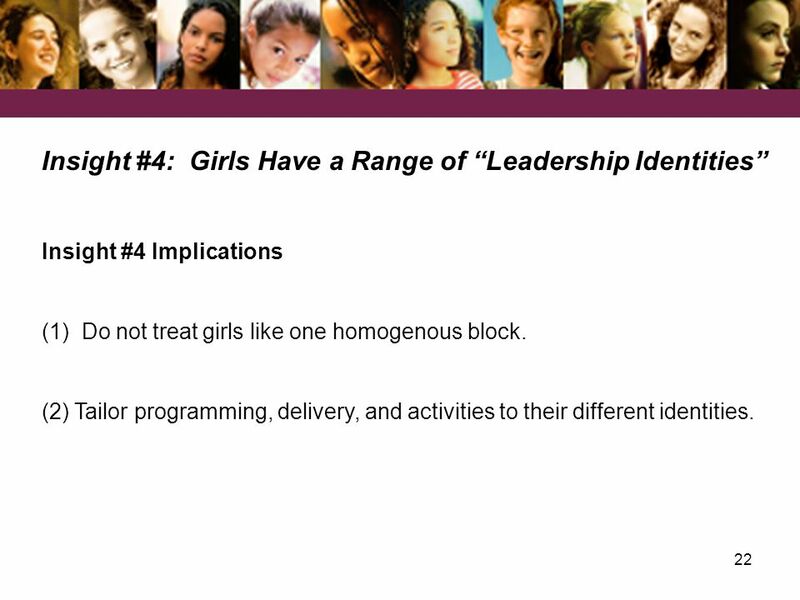 22 22 Insight #4: Girls Have a Range of “Leadership Identities” Insight #4 Implications (1) Do not treat girls like one homogenous block. (2) Tailor programming, delivery, and activities to their different identities. Download ppt "1 Change It Up! 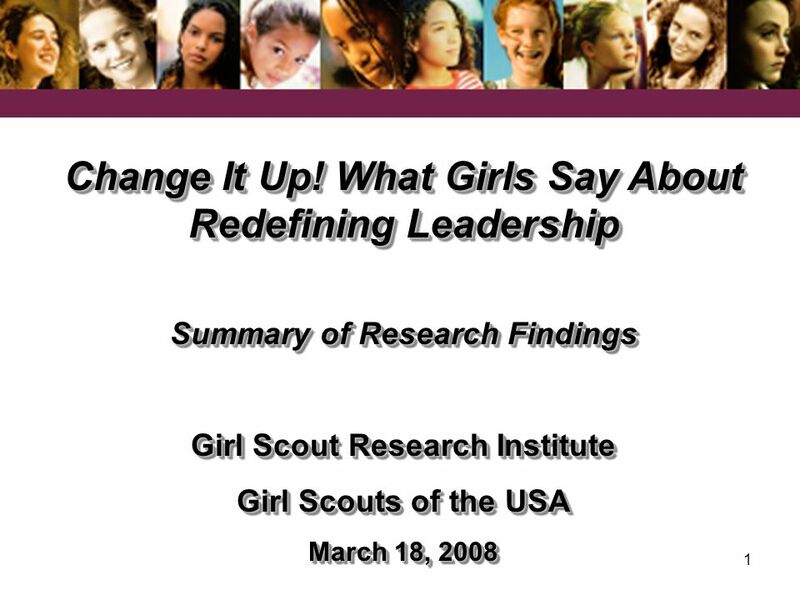 What Girls Say About Redefining Leadership Summary of Research Findings Girl Scout Research Institute Girl Scouts of the USA March 18,"
Welcome Youth Conference – Monday 19 th March 2007. 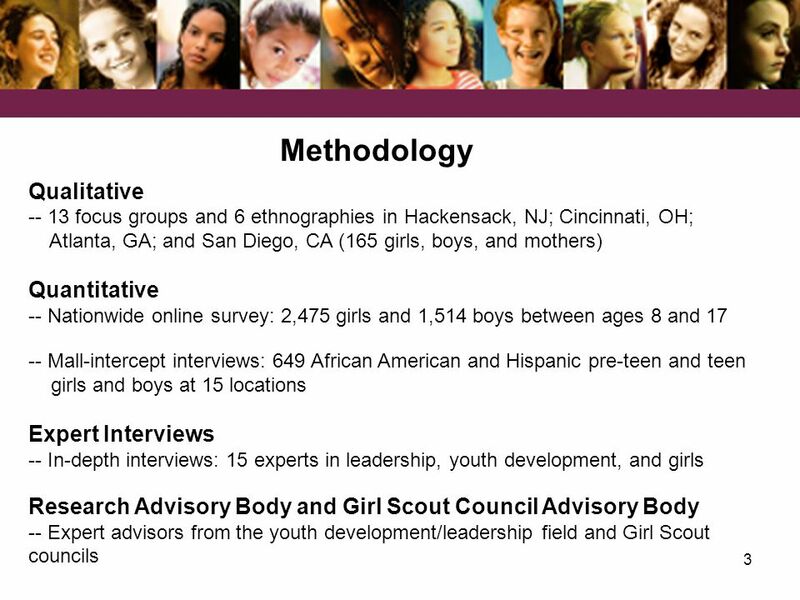 SIAP Cultural Benchmarking Project, Neighborhood Survey, Summary Presentation, Philadelphia-Camden Cultural Participation Benchmarking Project. In-Home Pantry Inventory Updated: November 2012. Background and Methodology Background In 1996 a National Eating Trends (NET) pantry survey found that.